The purpose of strategy is to for a leadership team to develop a shared understanding on what is going on inside and outside their organization, and to determine where it needs to focus its limited energies to improve its strategic position. I believe that “strategy” is easier to do than many of us think. Leaders of all organizations can do it. But for some reason unbeknownst to me, “strategy” has been made very complicated. PHDs are written on strategy, papers are published on strategy, MBA programmes teach strategy. Perhaps this is because some people feel a need to impress us with their complex strategies? Perhaps it is a way of reserving the domain of strategy for an elite group of people? Whatever the reason, it has had unintended consequences. For example, I work with a couple of young leaders who are intimidated by the term and feel they are not qualified to do strategy. This is absurd since they have an acute strategic awareness and an intuitive grasp of how their organizations should improve their strategic positions and social impact. I’ve written about the importance of the ongoing “strategic conversation” that interrogates assumptions and talks about the things that everyone wants to avoid. I much prefer this to the once-off and formal strategic planning process – while this may be necessary in certain circumstances, it cannot be the only mode of making strategic decisions. I have also found that that a simple strategy is more practical than a complicated strategy. A simple plan is easier to communicate and easier for everyone follow. The fewer moving parts there are, the less likely the plan will break under unexpected pressures. Even Steve Jobs’ plan to turnaround Apple in the 1990s was based on the simple idea of narrowing the product line and focusing on a handful of great pieces of technology. A mentor and colleague always advocates for the Occam’s Razor principle. In this context, it would state that the simplest and easiest-to-explain solution to a strategic problem is most likely the best one to implement. The social entrepreneurs I’ve worked with are aware of my preference for short strategic plans (e.g. <10 pages) that exist in a permanent state of collaborative work-in-progress. I have found these more effective than long “impressive” looking documents that quickly become outdated and live out the remainder of their lives in a filing cabinet. Remember the quote: “No plan survives contact with the enemy” by the Prussian military commander named Helmuth van Moltke. Our strategic environment is too complex and unpredictable to extrapolate plans into a future we mistakenly believe is stable. Therefore, we shouldn’t assume too much about the future. While our plans need to consider the future, they need to be implemented in the present. Some social entrepreneurs manage perfectly well with a one-page business plan, financial model and projections, and list of strategic priorities or shifts for the moment. Ultimately, all strategic processes will result in a set of decisions about what the organization should do and where it needs to focus its energy to move onto a better path or into a better space. The nature of these shifts will change over time. Some shifts will help the organization to capture a current or future opportunity; others will defend against an imminent risk; some shifts will just help strengthen an organization overall. Once these shifts are implemented, the need for other shifts will emerge. 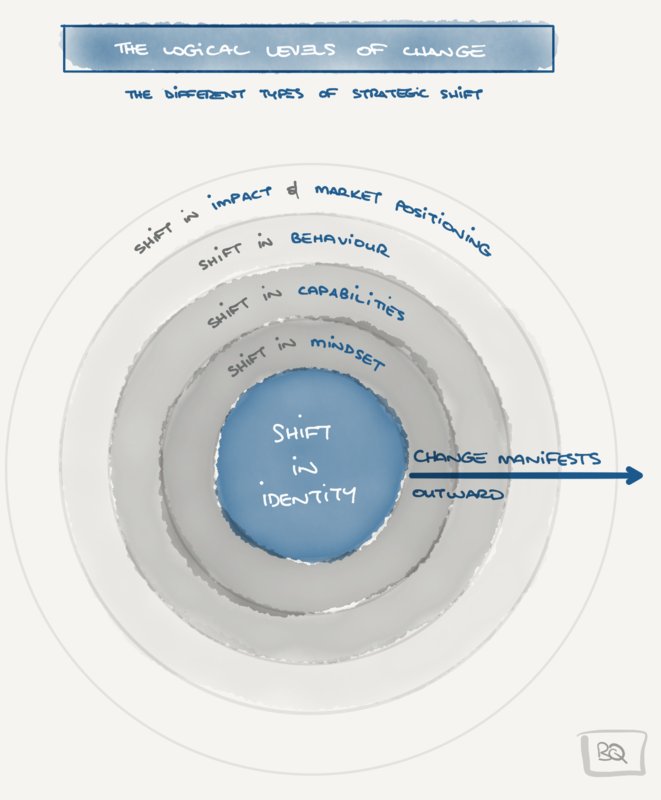 Shift in identity – How should the organization learn to see itself? Shift in mindset or beliefs – How must the organization think differently about its strategy, work, industry, strategic partnership, staff, beneficiaries, customers etc? Shift in capabilities – What must the organization become very good at doing? Shift in behaviour – How must the organization behave differently? Shift in impact and market positioning – What type of impact should the organization focus on achieving? How should it change its strategic position in its market or sector? This idea of focusing an organization’s energy on a handful of shifts is not a new. It pervades much of the business and strategy literature I’ve consumed – the recognition that we have limited time, energy, resources and money, and we can only aim to achieve so much at a time. This is something which I’m sure you’ve all experienced. I suggest you have an ongoing strategic conversation with your leadership team. If you’re a solopreneur, then have this conversation with the people close to you that care about what you’re striving to do. I recommend that your strategic plans are short, simple, accessible, collaborative and exist in real-time. I encourage you to carefully choose a handful of shifts at a time for your organization to undergo. Work on these until they are achieved or until something more significant comes along. Don’t make strategy more complicated than it needs to be. Focus rather on the process of strategy, than developing complex and elaborate documents that no one will read or be able to follow. Once strategic thinking becomes a habit, you’ll notice that it is much easier than you think. Thanks to Andy Simpson (Imani Development) and Philip Anastasiadis for their insightful contributions to this article, and to Brendan Quinlivan for the graphic.